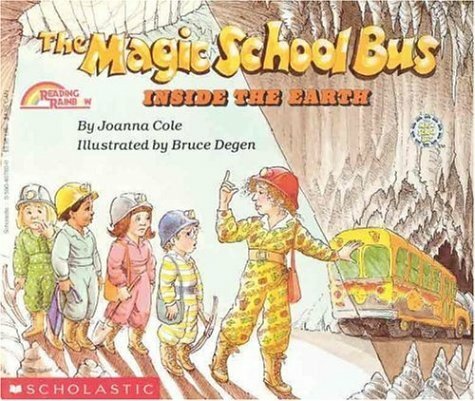 I have a confession to make: I want to be the modern-day Ms. Frizzle. The fictitious elementary school teacher not only inspires her young students with trips on the Magic School Bus, but is also a fashion icon! Dressed in solar-system dresses (complete with star-studded shoes) and igneous rock jumpsuits, she inspires her students through her lessons AND her fashion. In my continued quest for work-appropriate clothes, I have decided to launch my Ms. Frizzle collection. While my mom has recently made a solar-system cape for her third-grade space unit, I'm taking my mission a little less literally with classic work pieces in fun prints. My first piece was my Glasses and Gold Blazer, a clean-cut linen jacket in an amazingly fun Echino print. 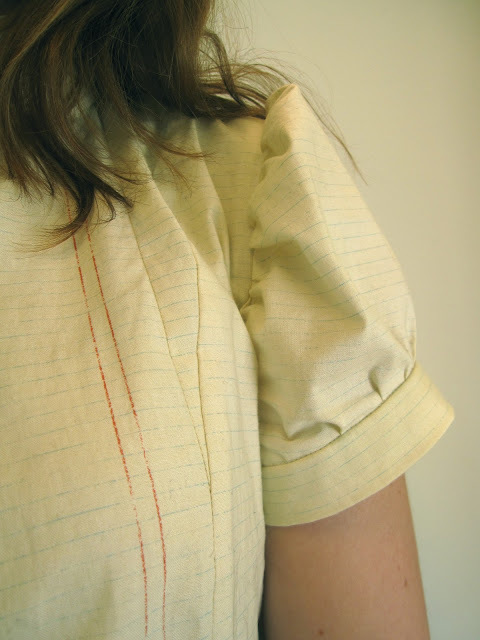 In this blouse, I was inspired by an awesome fabric with a lined-paper print, complete with red guide line running up the side. I've been wanting to try the JJ Blouse for a while, and knew this would be the perfect piece: serious and seriously playful. I also bought a math fabric, blouse TBD. Once I had made up the blouse, I decided to forgo the ruffles. 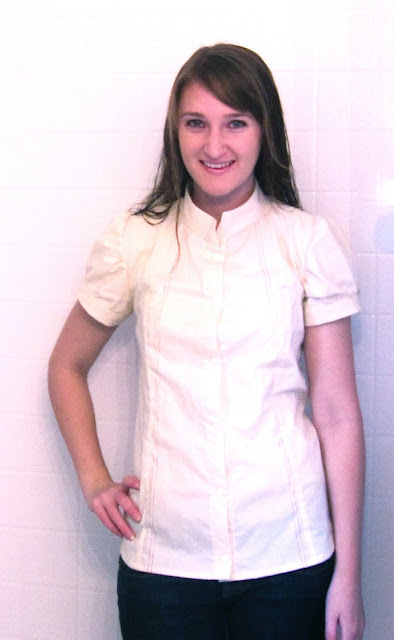 I also took the pattern in significantly--this blouse is huge! Cute! I love it, I just finished a dress I called the Ms Frizzle dress myself, so rock on! Wow, now that is awesome! You never told me you wanted to be Ms. Frizzle! This opens up a whole new perspective. The red-head teacher and mentor to kids... so fitting! We should have been Bill Nye and Ms. Frizzle for Halloween one of those times! !